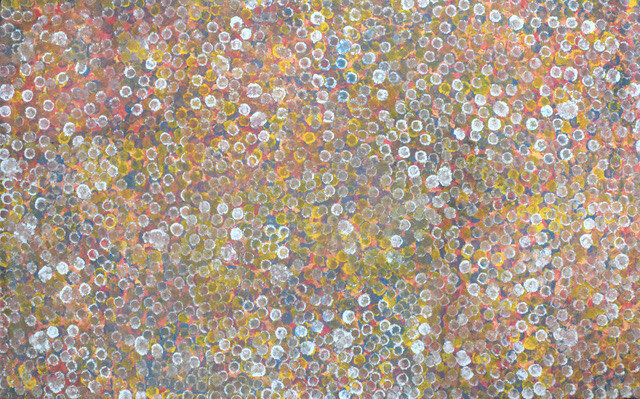 Emily Kame Kngwarreye was born around 1910 at Alkahere (Soakage Bore). She is one of the most successful artists to come out of Utopia and is arguably amongst the most important Australian painters of the last two decades. Her "Earths Creation" sold for a record $2,100,000.00 in late 2017- the highest price ever paid for an Australian woman artist at auction. An Eastern Anmatyerre speaker and one of the senior artists of the Utopian art Movement, like many other women at Utopia, Emily moved into painting with acrylics during the summer of 1988-89 with 'A Summer Project'. Emily happily moved from her silk batik work into this new medium, which gave her more creative freedom to explore different painting techniques. Her paintings reflect the layered transparency of batik, but her colour is translucent and has been built up through many touches of paint which overlap and meet to create an illusion of depth and movement. The emphasis on Emily's paintings is on the spiritual meaning, based in the tradition of her people. At first she painted aspects of her culture that are sacred, falling foul of the tribal elders. This led to her creating paintings of her culture as a whole. Though many Aboriginal paintings are focused on Dreamings, Emily chose to present a very broad picture of the land and how it supports their way of life. Emily, in her 80th year was described by the art collector, Michael Hollows, as being one of the most unusual and graphic of all Australia's renowned Aboriginal artists.